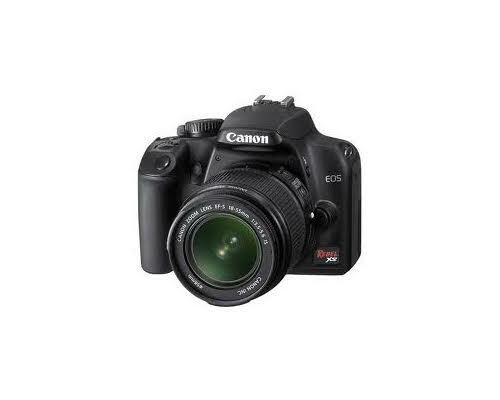 Canon's EOS Rebel XS is a 10.1 megapixel digital SLR camera intended for entry-level photographers looking for something more sophisticated than a simple, often limiting point and shoot digicam. The camera measures 4.96" by 3.8" by 2.4" and weighs approximately 15.9 ounces. It is an eye-level pentamirror with vertical and horizontal coverage at approximately 95%. It magnifies images at approximately .81x and has an eye point of approximately 21 mm from the lens center. Dioptric adjustment correction is available between -3.0 to +/- 1.0m. The camera uses a high sensitivity, high resolution, large single-plate CMOS sensor to capture images at a resolution of 10.10 effective megapixels (the camera offers 10.50 total). It shoots in an aspect ratio of 3:2 and features RGB color and low pass filters. It includes several auto white balance presets: auto, daylight, shade, cloudy, tungsten, white fluorescent light, flash, and custom, and color temperature correction for white balance correction (available in +/- 9 stops in full-stop increments), white balance bracketing (+/- 3 stops in full-stop increments), with blue/amber and magenta/green correction also possible. The viewfinder includes AF information, exposure information, flash information, monochrome shooting, white balance correction, maximum burst, and SD memory card information. It can write images to SD memory cards and SDHC memory cards. The camera can capture images in JPEG or RAW formats (or both simultaneously) in Standard, Portrait, Landscape, Neutral, Faithful, Monochrome, and user-defined styles in sizes between 1936 by 1288 pixels to 3888 by 2592 pixels. The printer supports printing JPEG images directly to PictBridge-compatible printers. The flash is retractable and pops up automatically. It has a guide number of 13/43, a 3-second recycling time, a 17mm lens angle, and +/- 2 stops in 1/3 or 1/2-stop increments for flash exposure compensation. The camera can produce a maximum of approximately 3 shots per second. The camera's display is a TFT color, liquid crystal monitor with approximately 230000 pixels. It offers approximately 100% coverage, 20 interface languages, and 7 levels of brightness control. Its display formats include single images, single image plus image-recording quality, shooting information, histogram, a 4-image or 9-image index, magnified view, rotated image, and image jump, as well as highlight alert to point out overexposed photos. The camera has a battery pack that can be recharged, as well as an optional Battery Grip to add support for AA batteries when necessary. When shooting still images in normal mode, it can take 600 still photos or 500 with 50% flash use at temperatures around 73 degrees Fahrenheit. In freezing temperatures, the camera can take 500 without flash and 400 with. Live view shooting reduces this amount considerably, as the camera can take approximately 200 photos without flash and 190 with 50% flash in normal temperatures and, in freezing temperatures, approximately 190 photos without flash and 180 with the flash at 50%. A second battery is built in to preserve the date and time. The camera's counterpart, the XSi, offers a larger view screen, 12 megapixels, and features spot metering, which may make that model worth the increase in price for some users over this one. Accessories include a remote switch, backpacks, gadget bags, several neck straps, and a semi-hard case. Also available are a compact power adapter, a car battery charger, a number of dioptric adjustment lens (rated between -4 and +2), a rubber frame for lenses, video and USB cables, data security kits, a DC coupler, and a different eyepiece. Other popular accessories include telephoto zoom lenses (it supports any Canon EF-S lens), tripods, and UV protection filters.